LEWISTON, Maine — Maine’s 2nd District U.S. Rep. Bruce Poliquin was lauded by the U.S. Chamber of Commerce during the monthly breakfast meeting of the Lewiston Auburn Metropolitan Chamber of Commerce on Thursday. Poliquin, a Republican, learned Thursday that he would receive the national business advocacy group’s “Spirit of Business” award for his work and voting record in Congress during a short ceremony at the Franco Center in Lewiston’s Little Canada neighborhood. Poliquin is seeking re-election this year against Democratic challenger Emily Cain. 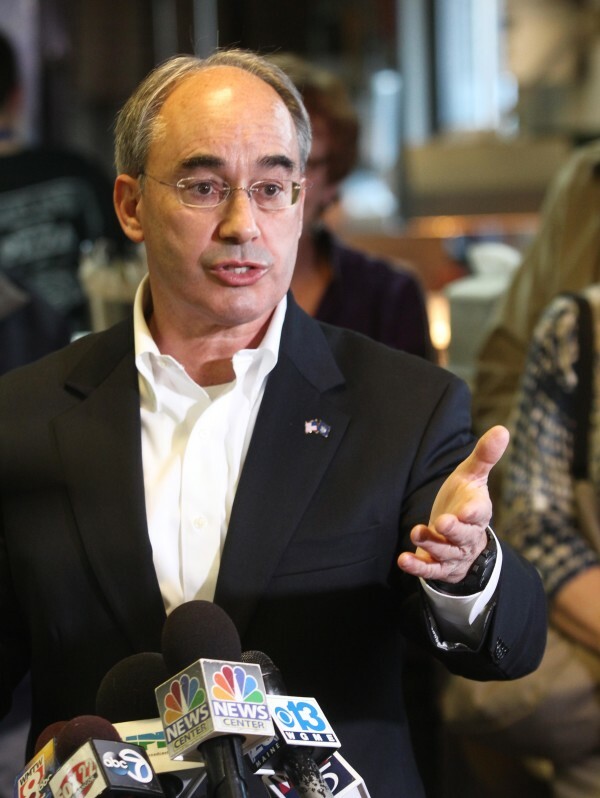 Poliquin won the open seat in a race against Cain and independent Blaine Richardson in 2014. Geoff O’Hara, vice president of regional affairs and advocacy for the U.S. Chamber, presented the award to Poliquin, noting he had scored a 95 out of 100 in the chamber’s rating system for lawmakers. O’Hara said all lawmakers who scored at least a 70 were given the award, but Poliquin stood out for his high score. “There are a million issues the congressman is doing a great job on,” O’Hara said. He specifically mentioned Poliquin’s advocacy for tax cuts for individuals and businesses. He also said Poliquin stood with business on lowering energy, fighting for fair international trade practices, “helping to fix Obamacare,” and advocating for improved transportation infrastructure. The announcement was a surprise to Poliquin, who will be formally presented the award next week in Washington, D.C., O’Hara said. Poliquin also addressed the chamber audience of about 300. He spoke for about 25 minutes and mentioned several initiatives on which he and other members of Maine’s congressional delegation are focused. He said trying to clean up that mess, however, was exactly why he ran for Congress. The first-term federal lawmaker who replaced a long-serving Democrat, Mike Michaud also noted he was carrying on some of Michaud’s work. That includes working to make the U.S. military equip its personnel with athletic footwear made in the U.S. and in Maine by New Balance, which employs about 900 workers in Norway, Skowhegan and Norridgewock. “We think it is really fair and right for the Pentagon to issue only fully American-made athletic shoes to fully-made American men and women in uniform,” Poliquin said. Poliquin said later the military equips recruits with everything from marching boots to underwear but doesn’t provide them with American-made athletic shoes. He also noted his work to improve federal inspection procedures for those who export sea urchins and sea cucumbers to markets in Asia. Poliquin said federal inspections at warehouses in New York were delaying shipments and spoiling a valuable commodity that’s a delicacy in some countries. The industry in Maine provides employment for as many as 600 workers, including the sea divers who harvest them. He said lobsters and other Maine shellfish were largely exempt from similar inspections. He said the issue, which is being supported by all of Maine’s lawmakers, looked like it was going to be solved. He also noted his office along with U.S. Sens. Susan Collins and Angus King have asked the Federal Trade Commission to investigate an issue involving the possible illegal dumping of a fabric material from China, that’s competing with Auburn Manufacturing — another local company that employs about 50 workers. “It’s all about jobs — it is flat-out all about jobs,” Poliquin said.